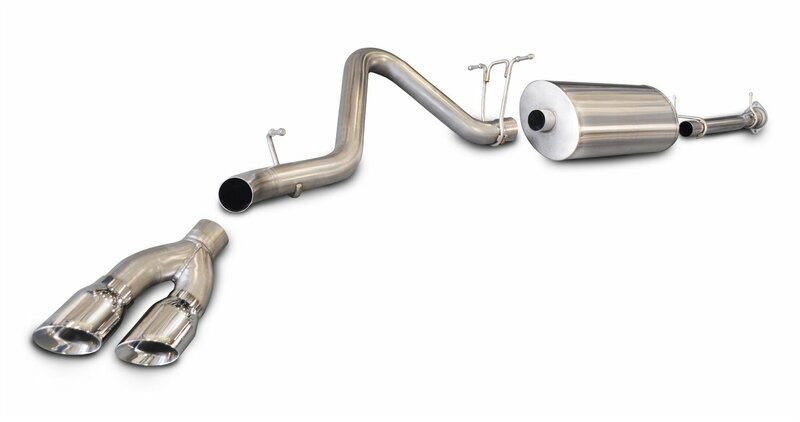 Best Exhaust System for Silverado 1500 6.0L in April 2019! 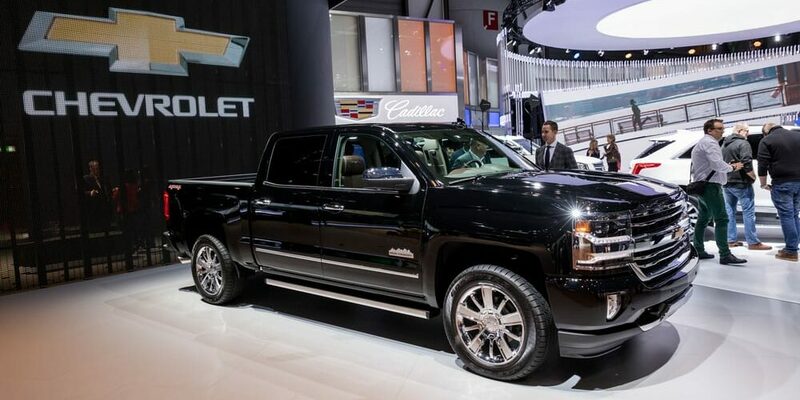 Best Exhaust System for Silverado 1500: A List for Your Convenience! Hi everyone, its Ken Coul again, this time with my review of the best exhaust systems for GMC 6.0 exhaust applications. These vehicles require top performance parts, and the kits in this review come only in the aftermarket. Pumping up your 6.0 Vortec exhaust size with an aftermarket exhaust system is the best way to deliver performance enhancements as well as pimping your ride with a loud and shiny system. Now, as many of you realize, there are many best performance exhausts for 6.0 Vortec motors and choosing the best one for you can be an issue. That’s why you have to consider all the reasons why you need to upgrade your system. Different applications demand different kits, and sound or looks are just a few of those reasons. I present to you the best exhaust for GMC Vortec 6.0, and just make sure you are buying the right fitment for your vehicles a specific year. Now let’s take a look at the five best models. 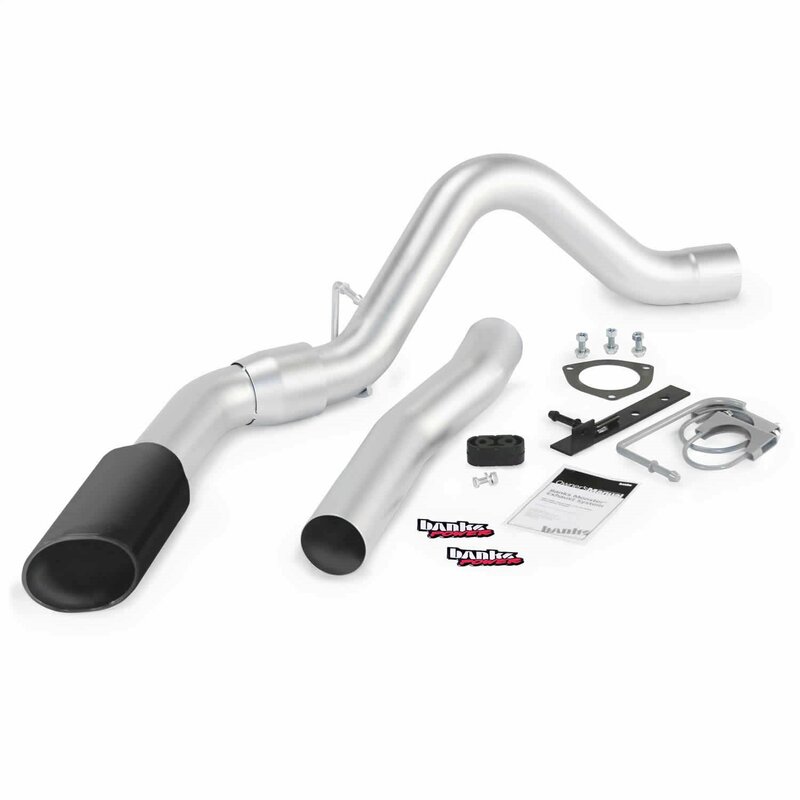 The Flowmaster Stainless Steel American Thunder exhaust systems are known for their deep rumble and long-lasting parts. This all stainless-steel system is constructed using the Flowmaster mandrel-bent tubing providing both longevity and performance. aFE is a top-level exhaust engineering supplier that manufactures some of the most intelligent systems around. Intelligent for one reason, they are designed to be easy for installation and to handle rugged environments. This model is for pumping up rather than pimping up. 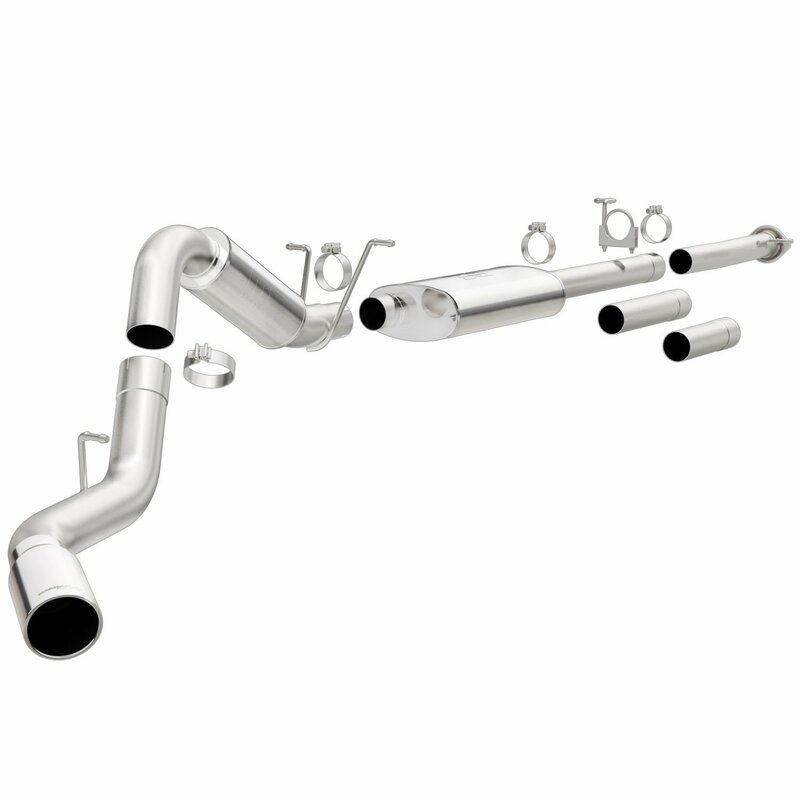 The aluminized steel system reduces cost, so you end up getting a very high-performance system delivering a very mild sound, all in all, a great working tool exhaust system. 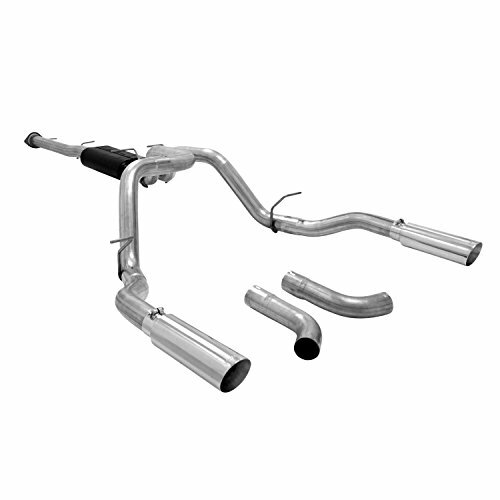 The MBRP XP Series exhaust systems are designed for heavy-duty performance while looking good. This means you get that polished steel finish delivering high-performance gas relief with an amazing rich yet mellow tone emerging from the engine. This model uses a single inlet and perforated outlet muffler, which is sort of a long tube designed to look like a muffler. That is why you end up getting that rich yet loud and mellow rumble you would most probably expect to hear from a much more powerful engine. The MagnaFlow MF Series, Performance exhaust systems, are designed for sound control, where they deliver that deep yet smooth rumble. They also balance the sound for exterior and interior considerations, making this an excellent choice for enthusiasts seeking a noticeable experience but without delivering a headache every time. This model uses a turbo style muffler to cancel out and dampen any high offensive tones; the end result is a very smooth and rich deep tone making this a perfect choice for sport and sport wannabe vehicles. 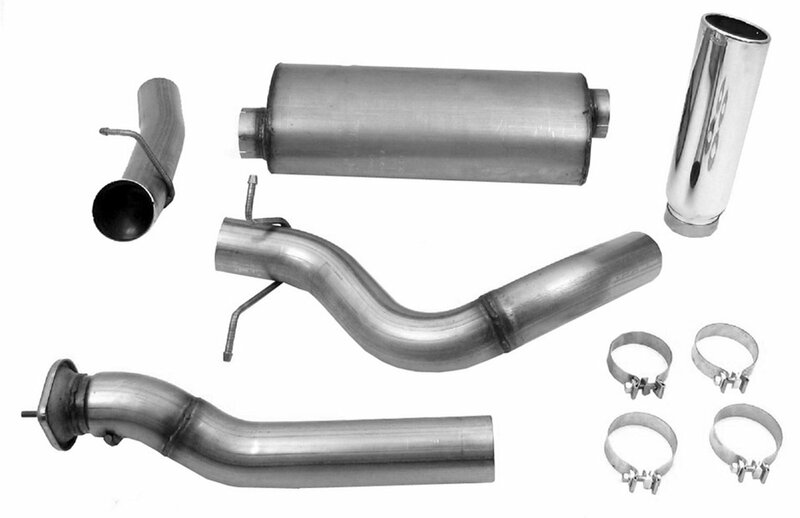 The Dynomax Ultra Flo exhaust kits come with a completely welded body and tubing using aluminized steel for budget-friendly optimized delivery performance. The hangers are located with OEM precision making this an easy kit to install. This is a no-nonsense kit aimed at improving the performance of your ride; it is not pimping or pumping up unit. The muffler is a state of the art perforated core type that delivers a clean yet low vibration canceling out a lot of reflective tones. Gibson Dual Sports Truck exhaust systems are designed for two purposes, look and performance, this is s a lethal combination of amazing looks combined with an engineered system that delivers high performance. Think of the Arnold Schwarzenegger or Usain Bolt of exhaust systems, and that just about describes the Dual Sports Truck Exhaust Systems #65650. Banks Monster exhaust systems are designed to handle the extreme temperatures produced by modern DPFs (diesel particulate filters). Banks’ CoolCuff design is engineered to lower extremely hot exhaust gas temperatures (EGTs) from the tailpipe, reducing the temperature load and improving overall performance. These are mandrel-bent stainless steel systems improving HP and torque. Corsa Sport exhaust systems use a straight-through design that delivers a non-restrictive performance and cancels out the reflective sound. This design also reduces back pressure and thereby increases performance to some degree of efficiency. This model is a stainless steel mandrel bent pipe system using a chambered muffler for delivering an aggressive sound. Exhaust systems are simple four-part constructions that connect to the engine and remove the exhaust gasses ejected by the piston rods after ignition. An engine is a finely tuned machine that requires both efficient air supply as well as an efficient waste air release system. Although exhaust systems might seem simple, there is a lot of science involved in their design. This science is around four elements, sound, temperature, flow, and durability. 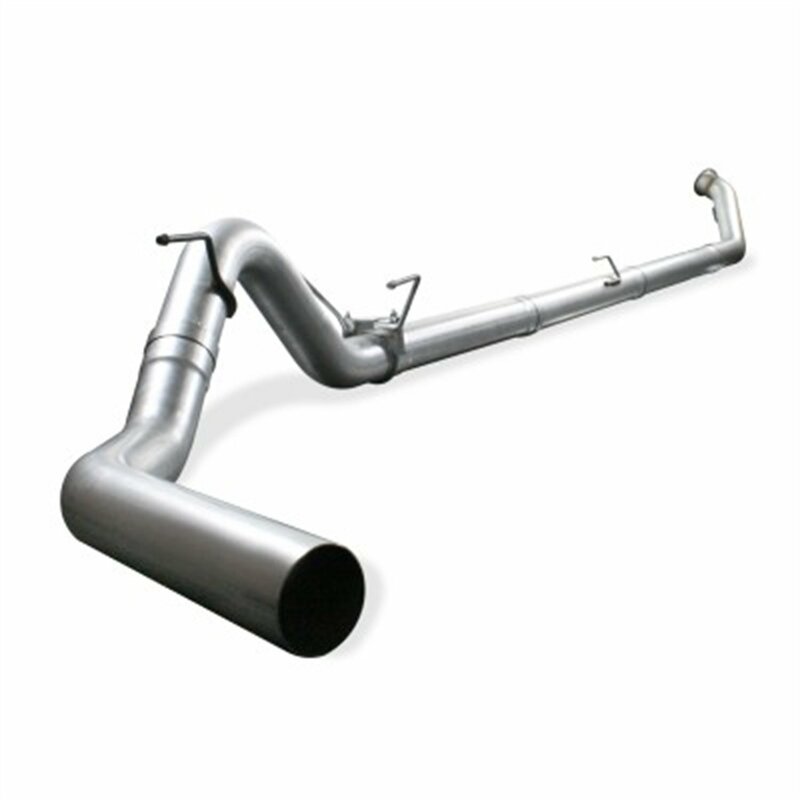 Therefore, a good exhaust system will provide fast release with no back pressure build-up, a sound management system to either boost or reduce the sound for different applications, a method to lower the temperature of the spent gasses as quickly as possible and built of rugged, durable materials to last decades. The exhaust manifold or commonly called in the aftermarket language, a header, is a single piece of cast steel or stainless steel that attaches to the engine head and is the first stage in channeling the exhaust gasses from the engine through the exhaust piping system. These are by law requirements in most states, and they convert unburned hydrocarbons, nitrogen, and carbon monoxide into carbon dioxide and water. It is illegal to touch this device unless you are maintaining it. Mufflers are used to reduce sound, there are a number of styles and designs, and each one delivers different sound management properties. 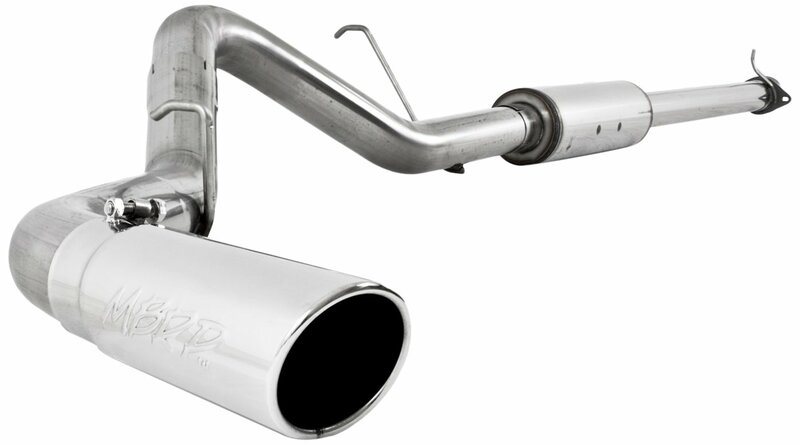 Think of an exhaust system as a trumpet, the muffler is the tuning stage in the system; this is where you control the outcoming sound by giving the muffler damping and channeling properties. All the pipes in an exhaust system are categorized into one group, but they are found in different sections of the whole. They start at the exhaust manifold, connecting to the casting and delivering the gasses to the catalytic converter (if you have one), from the cat they go to the muffler (again, if you have one) and form the muffler they are the tailpipe to tip. When installing an exhaust system, take into account a number of technical issues. The kit you buy must be one that is application defined. The kit should be bought only from a recognized manufacturer and preferably dealer too. Also, make sure you know what performance you want, is it for OE replacement, or is it an aftermarket upgrade/ If its an aftermarket upgrade, what do you desire? Show, sound, racing, power? Now let’s take a quick look at the seven steps to a seamless exhaust replacement process. Step 1: Clean out the workspace, make sure you only have your tools and replacement parts. Step 2: Lift the vehicle with an appropriate jack or jacks. Step 3: Disconnect your old exhaust system, you will need to use the saw here in most cases. Start by unclamping the pipe from the catalytic converter. If you cannot undo the clamp, saw the pipe. Step 4: Staring from the converter side, unhook all the brackets from the exhaust system. Step 5: Assemble the new exhaust system, makes sure to attach the clamps lightly, you will need to make adjustments to the system once it’s fully installed. Step 6: Slowly but surely work the new system into place, lining up to the OE hanging brackets. If you bought one of the above items or chose a similar product from any of the companies above, such as MBRP, Flowmaster, Magnaflow, etc., you will get an aligned system making your life easier. Step 7: Once you have installed the entire system you can now tighten all the clamps into place. Once this is done, you can lower your vehicle; you are ready to go.